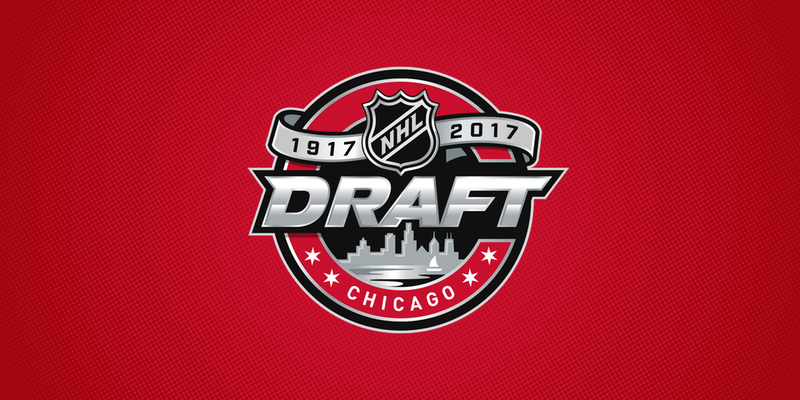 Over the next week or so, you are going to see your share of mock 2017 NHL Entry Drafts. We thought we’d do something a little different with ours and have a little fun. Here is the 2017 Blogger’s Tribune Mock Draft complete with trades and commentary. The closer we get to the Entry Draft, the more and more we see Nico Hischier being placed at the top of lists as the #1 prospect in the draft. There is no reason for this aside from the fact that Nolan Patrick barely played this season – and when he did he had to struggle through injuries. Patrick is the best player in the draft – that will be proven over time. Ray Shero know this and selects the ultra-talented two-way center to continue the rebuild in New Jersey. Seeing Patrick fall from the top spot is very reminiscent of the 2012 draft when Alex Galchenyuk was selected 3rd simply because he missed most of the season due to injury. When the Devils picked Patrick 1st overall, a frenzy was set off at the Philadelphia draft table. Calls from Vegas, Arizona, and Detroit looking to move up and draft the player many think might be the most dynamic in the draft. At the end of the day, no one came close to the asking price. The Flyers select the Halifax center with an eye towards slotting him in behind Giroux and Couturier down the middle next season. We know Jim Benning isn’t afraid to tell people what he wants to do – in this case, he steps up and pulls the trigger on a move that (finally) signals he is in full re-build mode. The Canucks want Casey Mittlestadt refuse to take the risk that he falls to them at #5. Mittlestadt is a skilled two-way center who skates really well and that some believe has top-line potential. The Canucks are very high on him and hope that year in the NCAA will prove that his skills can transition to more than just beating up on high school kids. Third overall will seem like a reach for some, but Jim Benning knows the guy he wants and isn’t going to sit around and wait for him. It’s no secret that Vancouver is looking to trade Chris Tanev – for some reason – and Benning finally finds a taker in the Dallas Stars, a team that would benefit a lot more from an impact veteran than they would from selecting a prospect at the top of the draft. Despite a bad season, the Stars are not a team in the middle of a re-build. Tanev solves a lot of problems for a team that has the potential to make a big jump up the standings next season. With their eyes set on Mittlestadt, the Avalanche once again got caught with their pants down only to miss out on the player they were excited to draft. As a result, the Avs move on to their next option – Cody Glass. A very different player from last year’s first round pick Tyson Jost, Glass is a big, strong center that brings a 200-foot game and will likely end up as a second liner in the NHL. He is a high IQ player that has had his offensive production numbers inflated by the system he plays in with the Winterhawks. He’ll have to prove that his skating is strong enough to be a true top-6 option in the NHL. Continuing his now annual tradition of over-drafting defensemen with the 5th overall pick, Jim Benning selects the prospect that has more hype behind his name than anyone else. Cale Makar is an exceptional skater that has tremendous skill, but is he the best defenseman in the draft? Some think Makar is the real deal, while other believe the hype train is running out of control. The undersized, puck-moving defender is going to give us a glimpse of which one is true next year in the NCAA. Adding Makar to Juolevi give the Canucks and their fans a future blueline to get excited about and regardless of how the rest of the draft turns out, Jim Benning is going to leave a happy man – even if the rest of us believe he spent two top-5 picks reaching on questionable picks. When George McPhee sat down at the draft table Friday night, he almost certainly didn’t expect Vilardi to fall into his lap at #6. The tall, rangy forward fought through injuries to become one of the best draft eligible players in the last few months of the OHL season. Vilardi spent a lot of the season in Windsor playing the wing, but whichever NHL drafts him will likely do so with the intention of keeping him at center full-time. He’s a decent skater that has the potential to get a lot better if a development team can get a few hitches out of his stride. He’s very good with the puck on his stick and spent the year giving many OHL fans flashbacks to Eric Staal’s time in the league. In a draft that lacks the star power of the past few, Vilardi is a very good piece to build around and Vegas could do a lot worse with their first pick in franchise history. The Coyotes already own Minnesota’s first-round pick thanks to a deadline deal for Martin Hanzal. Now the teams link up again to send Arizona’s 7th overall to the Wild in exchange for a player that fills a huge hole for the Yotes. In Dumba, Arizona gets the top-4 RD they desperately need. The team is loaded with high-end young talent and this is the time they move long-term future assets in exchange for immediate help. The Wild are not going to be able to protect all the players they would like in the expansion draft – as a result, they move the young RD for a significant asset as opposed to losing him to Vegas for nothing. In Tippett, the Wild get the bet pure scorer in the draft and a guy that isn’t going to be your star player but will make a very fine top-6 compliment. When Miro Heiskanen started to fall out of the top-5, Steve Yzerman started to make calls. The young Finn was outstanding in the U-18 tournament and is going to be the best defenseman to come out of this draft class. He’s smart and confident with the puck and having already played a season of professional hockey in Finland, he’s likely ready to come over and start his North American hockey journey. The Sabres need a defenseman themselves, but new General Manager Jason Botterill won’t be able to turn down the value he recieves to move down a half dozen picks. The assets he recieves will provide more resources as he begins to remake the Sabres in his image. The Montreal Canadiens have traded Alex Galchenyuk to the New York Rangers for Derek Stepan. In another one of Marc Bergevin’s hilariously nearsighted moves, he gives up on Alex Galchenyuk way too early in exchange for a player that is older, slower and much more expensive. At this point, the Habs have to go all in and this is a move that Bergevin feels would help his win-now philosophy. A year after the Brassard for Zibanejad trade, the Rangers once again identify a GM willing to give up on talent that doesn’t “fit” with his team. Knowing they have a long rebuild ahead of them, the Red Wings take Liljegren with the intention of bringing him along slowly and hoping that his rough draft year was an anomaly caused by injuries. The right-handed puck-mover came into this year as the consensus #2 in the draft. He is immensely talented and is a guy that will be very interesting to watch develop in Sweden next season. Andersson is an interesting prospect that has been getting some love from scouts in Bob McKenzie’s polls. He is a 200-foot player that has spent the past few years playing against competition above his age. He is a late 1998 birth-date that spent most of the season playing in the SHL. He ‘s looked very good for Sweden in international competition and is a guy that could be in the NHL sooner than most. He’s fast, and a great forechecker that can play both wing and center – his ability to play up and down the lineup, will make him a highly sought-after prospect. He is an electrifying player that has the potential to be an offensive star in the NHL. He’s a great skater that has a lot of confidence with the puck. Necas is a guy that could go anywhere from #5-20, there’s really no telling – it will depend on which team falls in love with his offensive upside and is able to overlook the rest. He has some weight to gain, but Necas might only be a year away from the NHL – something that will be very appealing to a Kings team that will need ELCs in the lineup. The Edmonton Oilers trade Jordan Eberle and Ryan Nugent-Hopkins to the Carolina Hurricanes in exchange for Jordan Staal, Haydn Fleury and Eddie Lack. Peter Chiarelli finally puts the past era of the Oilers behind him. This time, he packages the two guys that have been tied to trade rumours for years in order to get a big Chiarelli-style center and a young defenseman that he thinks can step into the lineup and help anchor the blueline for the next decade. From a Carolina perspective, this trade is a no-brainer. Fleury might be NHL ready, but the Canes already have a great young blueline so they are dealing from a position of strength. Staal is tough to give up, but moving him out in this trade means they improve the team’s offense significantly. At 6’2 but only 165lbs, Elias Pettersson is going to have to put on some weight before he makes the jump to the NHL. He skates well but looks a little fragile on the ice because of his slender build. He is both a great forechecker and back checker thanks to good speed and elite acceleration. He’s very smart and already seems to have a sense for how to bes optimize his skills. He’s a do-everything player, in that he can fill many roles and makes an impact in all three zone. He’s been climbing the draft boards and it would be surprising if he falls out of the early part of the first round. Like Logan Stanley a year before, the Jets prove they are willing to overlook some obvious flaws in order draft a big guy with a projectable NHL frame. Rasmussen is the epitome of the size-bias that still exists among NHL scouts. Some see him as a lock for the top-10, even a top-5 pick, despite the fact that he has almost no ability to produce in 5v5 situations. He’ll be an NHLer, in the same way that Brendan Gaunce is an NHL. He’s a worse skating Lawson Crouse with less offensive talent. The Jets will be spending a 13th overall pick to draft a future bottom-6 forward that can be a net-presence on the powerplay. If there’s one thing Jason Botterill knows from his time in Pittsburg, it’s that you can never go wrong building around two star centermen. The Sabres have one and Klim Kostin could very well be the second. After trading back in the draft, the Sabres select a player with extreme skill and immense confidence. He spoke at the combine about being ready to come over to North America next season. He’s likely a year away from contributing at the NHL level, but on a Sabres roster that is likely to be pretty young, Kostin could find his way into the lineup. He’s a guy that isn’t talked about much – probably because he spent the year in Russia – but the Sabres could do a lot worse with their first pick of the new era. With Eichel and Kostin, the Sabres would be set down the middle for a long time. The Colorado Avalanche trade Matt Duchene to the New York Islanders in exchange for New York’s first round pick (#15 overall), defenseman Ryan Pulock and forwards Josh Ho-Sang. As ill-advised as it might be, the Avs finally move on from Matt Duchene after a year of trade rumours. The saving grace is that Colorado hits an absolute home run with the pick they receive in the deal. Like last year, the Avs select an incredibly talented center in the middle of the first round. Nick Suzuki was one of the best players in the OHL this season and he is a player that has limitless offensive potential. Leaving Friday night of the draft with Cody Glass, Nick Suzuki, Josh Ho-Sang and Ryan Pulock is a coup for the Avalanche – though in reality isn’t something their front office is smart enough to pull off. At 16, the Flames get a defender that many believe might be underrated among certain scouts. He’s small for an NHL defender, but he’s fast, poised and incredibly confident with the puck. He was Sweden’s best player at the U18 this spring and could emerge from the SHL next season looking like one of the best prospects in the world. Brannstrom is very young – doesn’t turn 18 until next September – and has already spent the majority of a season playing in Sweden’s top league. The Leafs have a very specific player in mind and they know they can select him later in the first, so they might as well pick up an extra asset while doing so. The Blues see Vesalainen fall and they can’t resist moving up. He was the best player at the U18 tournament this spring and he has the talent to be a top-5 pick. A year of coaching and development to get his mind in a place that he can be motivated consistently and Vesalainen is going to be someone Blues fans get very excited about. Going the NCAA route paid off for Boston last year and they hope it does again in 2017. In Ryan Poehling, the Bruins get a very young player with a lot of room to grow – he was the youngest player in NCAA hockey last year. Poehling is a very solid all-around center with NHL size and a penchant for learning quickly. Some believe that he’s just as good a prospect as Casey Mittlestadt who was selected 15 picks earlier. Hague is big, tough, and is the ideal defensive prospect to groom for the Western Conference. He is a good skater and has a two-way game that reminds some scouts of Brent Burns during his junior career – both in terms of physical tools and mental lapses. He doesn’t have the best instincts and is able to use his size to make up for mistakes in the OHL – something that won’t fly in the NHL. He’ll likely end up as a second pairing defenseman that will contribute on the powerplay thanks to his cannon from the point. The Maple Leafs knew who they wanted to pick and knew they would be able to trade down a few picks to get him. In Robert Thomas, the Leafs are getting a two-way center that gained confidence as the season went on – turning into a legitimate offensive weapon for London. He is a tremendous playmaker that looks an awful lot like Nazem Kadri did during his OHL days – the difference is that Thomas is much further along defensively than Naz was at the same age. He is going to be one of the best players in the OHL next season and another example of a great London Knight turned Maple Leafs in a few years. You’re going to hear about Tolvanen ‘falling’ on draft day. There is a reason for that. Starting the year as a 5-10 pick, Tolvanen hasn’t shown the kind of development many have thought he should. Tolvanen is a 5’10 sniper that hasn’t shown much progress in the rest of his game. He does one thing wI’ll- and i’ll concede that that thing really, really well. The type of scoring skill that he has is valuable to an NHL team, he just doesn’t have the game to be drafted any higher than this. That said, he’s an Oshawa Generals draft pick, so if he decides to decline his spot at Boston College to play in the OHL, he will instantly become my favourite player from this first round. Everyone knows the Leafs are going to be shopping for ar least one RD this summer. After being priced out of the big-time guys, the team moves on to plan B and calls Philly about Gudas. The 27-year old would provide the Leafs with a solid two-way option that can play in the team’s bottom-4 and he is on a decent contract that expires when he turns 30. From a Flyers perspective, the team gains some much-needed help on the wing for their top-9 forwards. A 20 goal scorer that can bump guys like Dale Weise down the lineup and it would save them some money against the salary cap. The team has both Samuel Morin and Travis Sanheim (who shoots left but plays on the rights side) in the minors and both look like they are ready to step into the NHL. The rest is mostly just depth filler but in Sparks, the Flyers get an option at backup as they move away from Steve Mason and Scott Laughton would act as depth down the middle to ensure the Leafs don’t need to use Ben Smith this season. In Valimaki, the Oilers get a guy that will instantly become their best defensive prospect in a long while. Seeing him slip to them, the Oilers can’t pass on the two-way defender that might come across as a little boring because of the fact that his game is so solid. He took a huge step in his offensive game this season in the WHL, showing has shown he has the ability to be a powerplay quarterback and playmaker from the back end. He could stand to become a better shooter, but that’s nit-picking given that his strength will be distributing to his teammates. After trying to trade down to select the top goalie in the draft, John Chayka decided to hold on to the pick when he couldn’t get the right value for #23. Standing pat, the Coyotes select the best player on their board. Callen Foote is a big rugged defender that might not have top pairing potential, but he is one of the safest picks in the draft. He will be an NHLer for a long time and is very likely to carve out a role as an elite #3 guy on a good team. Expansion draft trade: The Blue Jackets pay Vegas their first round pick along with Sonny Milano, in exchange the Knights select David Clarkson instead of Joonas Korpisalo in the expansion draft. Drafting Kailer Yamamoto in the 20s will likely be the best thing the Vegas Golden Knights do in their inaugural season. Kailer is small, very small – if he were a few inches taller he’d be a stone cold lock to be drafted in the top-5. He is an elite offensive talent that is smart enough to overcome his biggest weakness. He’s small, but he knows is and is able to use his elusiveness and puck skills to make bigger defenders look foolish. Over the past few years, we’ve learned that skill trumps size in the NHL – many scouts still don’t want to believe it, but maybe Yamamoto’s inevitable success will open the eyes of those who are stuck in the past. Speaking of teams that are stuck in the past, the Montreal Canadiens use their first round pick on Isaac Ratcliffe – a very big winger from Guelph. A full 10 inches taller than Yamamoto, Ratcliffe is the player people think Michael Rasmussen is. He is a power forward, with good finishing ability that has to work on his overall skating ability. Ratcliffe is a smart player that knows how to put himself in a position to maximize his size and strength. He’s very good at finishing down low and provides a presence in front of the net that you see from guys like James van Riemsdyk. He’ll need to work on his puck carrying ability but if the Habs draft him thinking he’ll be a middle-six winger, they likely won’t be disappointed. Comtois is seen as a safe pick that doesn’t have the high-end ceiling you’d like to see from a first-rounder, but he is also a lot less likely to be a bust. He’s fallen down the draft rankings this season thanks to a lack of production in the QMJHL. He’s a very smart player that contributes away from the puck and has the ability to play off of his linemates. He works hard every shift and forechecks with an energy that you want from a 3rd line winger. He’s not a prospect ot get overly excited about, but he’s the kind of guy that will show up in the NHL in a few yers and play a decent role on a good team. Jason Robertson is a goal scoring winger that can’t seem to shake the reputation of being a poor skater. Scoring a ridiculous 25% of his team’s goals this season in Kingston, Robertson has developed into a player that has legitimate top-6 potential in the NHL. His skating is still only a little better than average but it is vastly improved from where it was. He has shown an ability to work, learn and improve at a rate that should be encouraging to anyone drafting him. The youngest of the three Strome brothers has a long way to go before he can skate at an NHL level. That said, he has great puck skills for a player his size and when he is able to find time and space for himself, he has great finishing ability. He’s a smart player that has the strength to move the puck through traffic – something that is necessary given his lack of speed. He’ll be drafted at the end of the first round, with an eye towards the distant future and the hopes that a few summer with NHL skating and development coaches will pay dividends. Yet another Finnish defender, Vaakanainen is a guy that excels on the defensive side of the puck. He’s got decent puck moving skills, but his bread and butter is playing a lock-down role in his own end and on the penalty kill. He moves well and is able to use a strong stride to close gaps when defending against high-end offensive players. Vaakanainen works well with his stick and is just an all-around disruptive player both in transition and in his own end. This is an example of the rich getting richer. Kole Lind is a tremendous offensive player that NAsshille will be ecstatic to be able to draft at #30. He’s a big playmaker that has good speed once he gets going and if he played center, he’d likely be talked about as a mid-first round pick. He needs to learn to shoot a little more – Lind has a tendency to rely on his linemates too much. He’s also going to have to learn to look a lot more engaged when he doesn’t have the puck on his stick – something that you’d assume could be coached into a player with the kind of instincts Lind has. Draft day trade: The Pittsburgh Penguins trade Patrick Hornqvist + 31 overall for #78 overall. With only 13 skaters under contract and a little over $12m in cap space, the Penguins are forced to shed salary and are willing to move down 47 picks in order to move Hornqvist and his $4.25m cap hit. The Coyotes once again use their salary cap flexibility as an asset and are able to acquire another first round pick. With the pick, the Coyotes take the first goalie in the draft. Michael DiPietro is the most physically talented netminder in the class and if he were taller than 6-feet he would be selected somewhere in the first half of the round. He’s quick, athletic, and gives Arizona the high-end goaltending prospect their system desperately needs. He spent over 2/3 of his time with Crosby or Malkin and put up 24 goal/ 52 point pace. Also his WOWYs away from Crosby/Malkin are impressive. He might get traded, but there will be a market for him. It seemed legit until I got to the Leafs pick at 17. The Leafs would want nothing to do with Radko Gudas or Scott Laughton for free never mind losing Conner Brown who quickly became a favorite of Coach Babcock. Brown can play up and down the lineup, kills penalties and is coming off a 900k entry level deal. He is 23 and filled in late, he looked like a different player size wise at the start of last year.In other words he has much value around the league. I doubt the Canucks take Mittle at 3OA. They would do with either Glass or VIlardi there.